If you don’t like your food too spicy you could always leave out the fresh red chilli and just use a pinch of cayenne pepper with the dried spices at the start. Either way, this is a delicious side dish which feels like a real indulgence. Even my hubbie, who is not a fan of a sweet potato, loves this!! Pre heat the oven to 180c and pop a baking tray inside to warm up. Pop the unpeeled sweet potato slices into a sauce pan and par boil in salted boiling water for 5 minutes until softened a little. Remove the baking tray from the oven and spray with 1kal. Drain the potatoes, give a little shake and then pop straight onto the warm baking tray. Sprinkle over the smoked paprika and ground coriander and season well with salt and pepper. Spray with 1kal and then pop back in the oven for 30-40 minutes until the potato is cooked through and has started to colour a little. Remove from the oven, top with the grated cheese and pop back in the oven for a few minutes until the cheese melts. Remove again from the oven and pop the cooked skins onto a plate or serving board. Mix one tbsp. 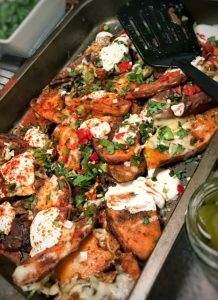 of the soured cream with the chipotle and drizzle over the wedges. Drizzle the other tbsp. of soured cream over the wedges plain. Top with a scattering of spring onions, red chillis and fresh coriander. Now I want to get the BBQ out….they look fabulous. Always wanted to try beer can chicken….drooling in anticipation!!!! Am I missing a step, why do we need 2 baking trays in the oven?